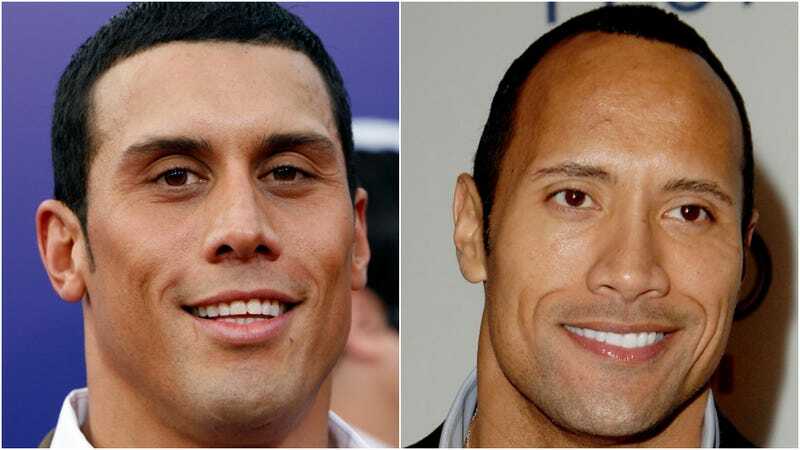 This may not be news for the specific subset of readers who are deeply plugged in to the stunt-double community—which, according to the laws of the internet, someone out there must be—but hopefully the rest of you will be as delighted as we were to discover that Tanoai Reed, Dwayne “The Rock” Johnson’s stuntman of more than 15 years, is also Johnson’s distant cousin. This news is detailed in an extended profile published today in Mel Magazine, where Reed recalls being chased down by a stunt coordinator at Universal Studios, where he had been working as a day laborer, and asked: “Dude, we’re doing this movie called The Scorpion King. The Rock’s in it. We need a stunt double. Can you come to the office real quick?” A white stuntman had been standing in for Johnson up until that point, until the laborious process of painting the man to match Johnson’s skin tone every day became too much for the production. Reed was hired on the spot. Serendipitously enough, when the two met, they discovered through some on-set small talk that they were related through their great-grandfathers. (Or, at least, Johnson discovered it—Reed was already very aware of Johnson, who comes from a famous Samoan pro-wrestling clan, and their extended family connection.) They’ve been working together since, with Reed taking risks and sustaining injuries on behalf of his more famous cousin: Last year alone, he broke his wrist on the set of Jumanji: Welcome To The Jungle and his heel on the set of Rampage. who's all about family now, Vin?